Finally, pictures of the finished Blustery. Blustery has in fact been finished for quite a long time, but the weather, I, the camera and the photographer haven’t been present at the same time. Well, the weather has been there all the time, but when I, the camera with loaded batteries and a photographer have been present, then the weather has decided to stop co-operating, and to show who is the boss, and rain has poured down on us all. Folks, this is the best I have been able to come up with. Sunny weather, check, camera with loaded batteries, check, I, check, Blustery, check, photographer, oh no! Blustery was a nice project to work on. Instead of Anna Bell’s suggested yarn Debbi Bliss Cashmerino DK I used Rowan WoolCotton, since that was what I had in my stash, and it worked very well. I’m a little ashamed to admit that I don’t anymore remember what needles I used (it IS some time since I finished and there has been a lot of water running under the bridge since the moment I cast off). 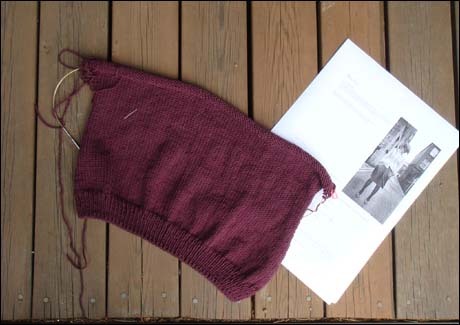 But what I want to point out is that Blustery has several interesting features making it a great knit: tubular cast on, tubular sewn cast off, pocket, side shaping...need I say more? There was entertainment all the time. Anna’s pattern is very clear and well written, and caused me no problems. I'm sorry my un-modelled picture is not really showing up this vest at it's best. What I’m still a bit undecided on are the buttons. I love the buttons (sorry for the a bit blurry picture), they are from my Mum’s stash that I got years ago, but can very well be from my Gran’s stash originally (we are talking real vintage here). 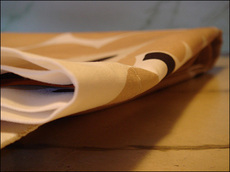 But they are a bit heavy, and drag the fabric a bit. A lighter, flatter button could be an alternative. What do you think? Coming up next: the mitten season has begun! Two mittens in progress to show, I need only to get pictures of them. Thankfully mittens in progress can be pictured un-modelled. One factor less to take in to consideration! Schools started last week, and I have had my hands filled with odds and ends. But a little knitting has been done! To cut a long story short, my computer, which has served me faithfully for three years, crashed today. Like in dead. It took me eaons of time to find the right log in page to Movable type, to find my copies with all password, to install Photoshop, to install mails and you name it more to our second laptop. But now it's done, and I'm free to blog again. But I have no spell check, so please, do not complain on grammar or spelling mistakes. I feel it's time for a WIP update again. Those with eyes for details have perhaps noted that the sidebar got updated a couple of days ago, and I have now updated it with a third project. First up on my now ongoing projects is Blustery. Blustery is a very simple vest by the talented Anna Bell. 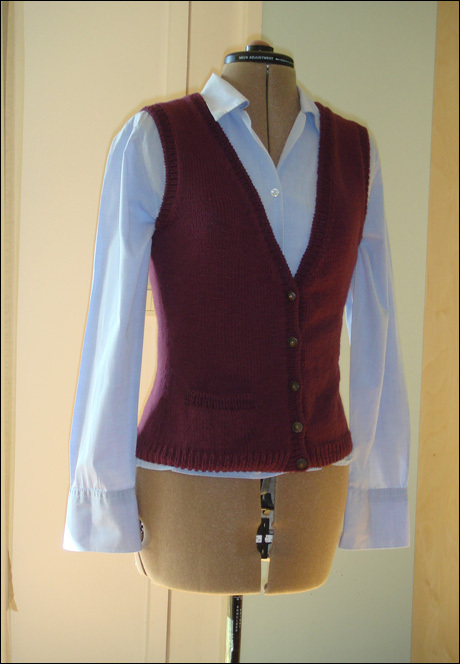 I like the clean cut od the vest and the small pockets. 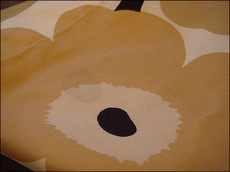 Anna's pattern have been very good for my body tye before, and I have high expactations on Bluster. 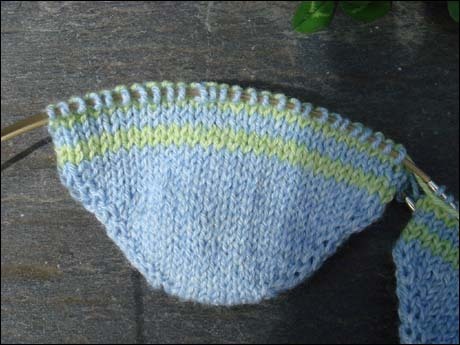 The pattern is written for Debbie Bliss Cashmerino Baby, but my yarn choice is this time Rowan WoolCotton. I have enough yarn in the stash in this lovely plum colour. 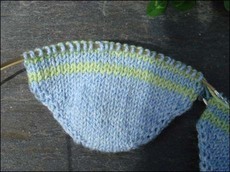 WoolCtton is a bit thinner than Cashmerino Baby, thus I had to change to 3,75 mm needles instead of the suggested 4 mm. Blustery is cast on with a beautiful tubular cast on, that really looks neat. Want to see it?Just click here! I had one big ball of the Finnish yarn Novita Nalle in the stash, a dark carchoral grey colour. It should be enough for knee high socks, and I immedetliaty came to think about the Spiral Boot socks by Veronik Avery, from Interweave Knits Summer 2007. I'm knitting on 2,5 mm dpns, and I'm about halfway down the first leg. 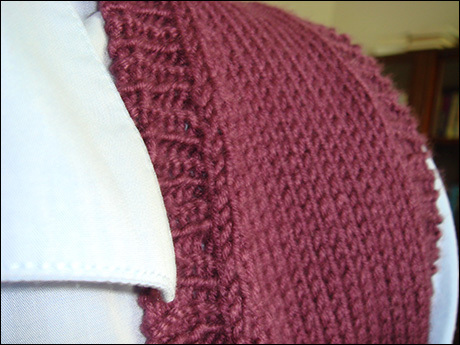 The pattern is very fun to knit, and very clever. There are three different patterns in the leg spiral, all of them basically the same, but with different amounts of stitches. As you advance down the leg you decrease stitches twice, and shape the leg that way. But the increases are almost invisible, and it looks like the same pattern continuing from the top to the bottom of the leg. I think I have enough with yarn, the pattern requires three 50 gram balls, and my big ball is 150 grams. 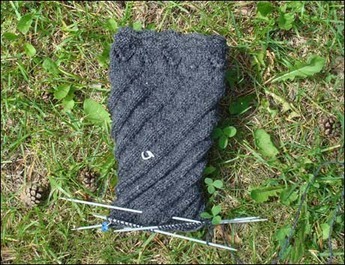 And third on the list is a pair of socks I cast on as travelling knitting. They are a simple pair of striped socks, knitted from the toe up in Regia cotton, and sized for my older daughter. I have a little more of the blue yarn, and I will knit the toes and heels with that colour. I'm interested in using up all the yarns scraps, but to get the socks look the same. There is also the risk of getting a second sock syndrome with a pair as simple as these, and this tofether with the goal of using up all the yarn, is the reason why I decided to try to knit both socks at the same time, using the magic loop technique. I have never before used it for anything but the toe part of toe-up socks and for small projects, but it goes quite nice with both of the socks on the needle at one time. It also makes the shuffle of the needle and the loops less irritating when you can knit both socks before you have to shift places for the needleends. That's all for today folks! I'll update the different projects as I advance. Have a nice day all of you. Sun is finally back here in the south of Finland, goodbye rainy days for a while again!